When Alabama needed a big play to avoid being yet another top-five team to fall victim to an upset, they wisely turned to their most explosive playmaker to bail them out. 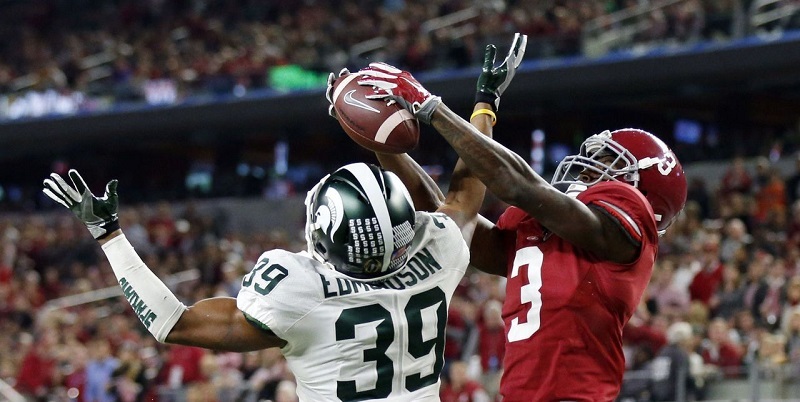 And that’s exactly what Calvin Ridley did all night long. Ridley hadn’t eclipsed 100 yards in a game yet this season, but needed just five receptions to rip off 171 yards in the Crimson Tide’s 31-24 road win over Mississippi State on Saturday night, averaging 34.2 yards per reception. Ridley is not going to blow people away with his measurables. He’s not huge and he’s not a burner. He’s a steady, productive wide receiver at college football’s most elite program. I never know what to do with these Alabama players. Everyone thought Amari Cooper would be one of the best receivers in the NFL and he’s about the third best wide receiver on the Raiders currently. What I like about Ridley’s production at Alabama is he does it with limited opportunities in a run-heavy offense. If Ridley adds about 10-15 pounds, he could be Anquan Boldin in the NFL. Great hands. Great in traffic. Fearless. Because the entire sports world will be watching so why wouldn’t you? Every game Alabama plays is a big game but this Iron Bowl, at Auburn, with the playoffs on the line, will be the most exciting atmosphere in college football all season long. Will be interesting to watch Ridley under these lights.